How easy is it at your company to start a Teams or Skype meeting online in your conference room without technical difficulties? Maybe you have a very large (and expensive) video conference system in your board room but you wish you also could equip the smaller huddle rooms with such systems? 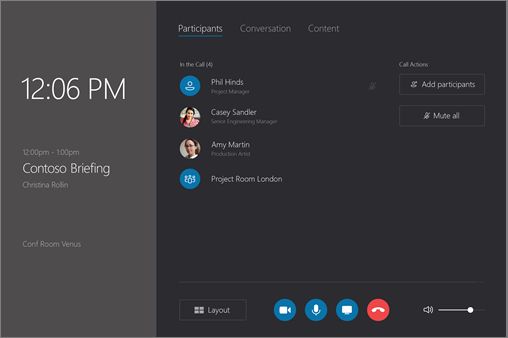 Then you should look into Microsoft Teams Rooms which is the new name for Skype Room Systems. All you have to do is to click Join on your meeting and within a few seconds the meetings is started, all participants are joined, no matter if it’s via the Teams/Skype client, the web client, app on their phone or have dialed in to the number in the invitation. You see the participants on the control unit and on the bigscreen in front of the room and of course their video if they share it. From the control unit you can mute/unmute and and instantly add participants to the meeting from the directory or call them. Want to share your screen? Simple, just plug in the HDMI cable to your laptop and it will output to the bigscreen but also share it in the meeting with remote participants. Of course, remote participants can also share their screen in the meeting. It’s the simplicity – one-click-join and the meeting is started. You no longer need to be a technician to get a meeting started, choosing the correct input on the bigscreen, choose the right speaker and mic. 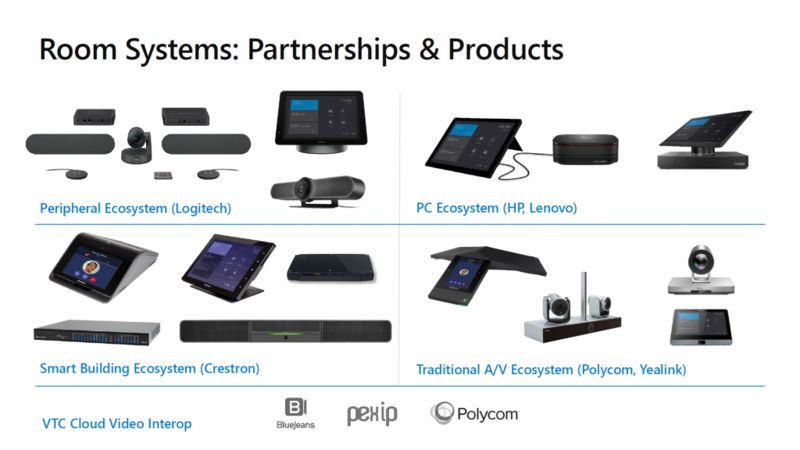 Xenit has used Skype Room Systems for a long time and are extremely happy how it works. So what about the tech and for IT? 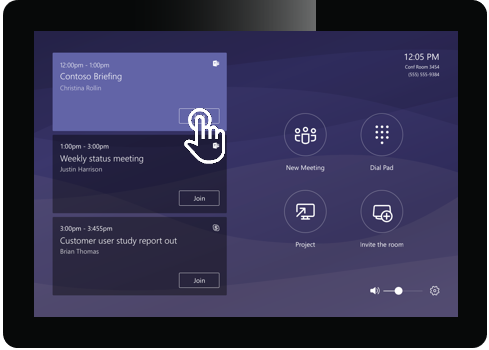 Compared to other proprietary systems, Microsoft Teams Rooms run on Windows 10 with an Windows app. This means you can use your current tools for deploying and managing it as you would do for any other Windows client except that you need to make sure not all policies apply to the system. On-premise AD join, Azure AD join and Workgroup are all supported. The app itself, which only installs on certified devices so you can’t do this DIY, is automatically updated through the Windows Store. So for us at Xenit, it has been almost no support for this system since it was first setup – except for some occasional hardware issues where someone was “smart” to disconnect the HDMI cabling to connect it directly to their laptop. 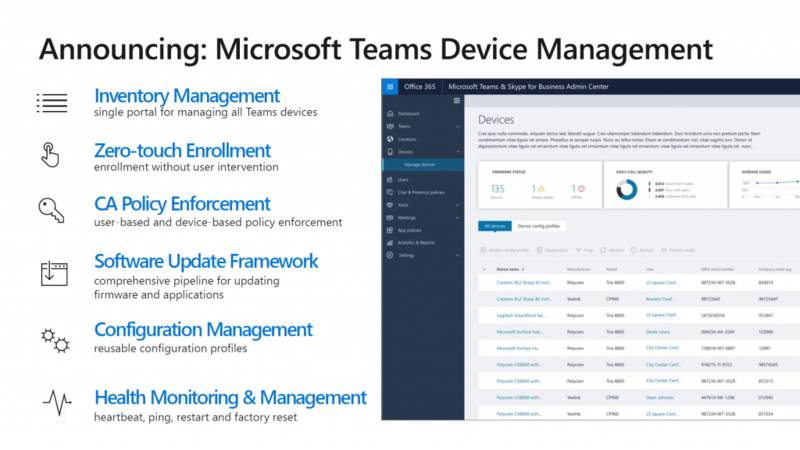 Of course, Microsoft has done some work to cloud enable these devices if you want. All this can be alerted upon so you hopefully can solve problems before someone calls it in as a problem. In a few months, the Microsoft Teams Rooms will light up in the Teams Admin Center for additional functionality. For example, if you enroll many of these devices, the admin center will enable you to more quickly enroll them with a profile with settings you want. It will also make it easier for inventory management, updates, monitoring and reporting. Let us know if you want to discuss or even get a personal demo at our office.